IL-7 is a cytokine that acts as a growth factor for early lymphoid cells of both B- and T-cell lineages. IL-9 is a multifunctional cytokine that, although originally described as a T-cell growth factor, its function in T-cell response remains unclear. This entry represents interleukin-7 (IL7), it is a hematopoietic growth factor produced by bone marrow stromal cells. It promotes growth of B-cell precursors and functions with IL2 in the activation of mature T-cells [(PUBMED:2643102), (PUBMED:3259677)]. 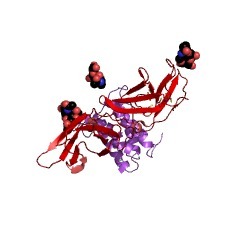 Interleukin-7 and Interleukin-9 belong to the same larger family. There are 56 IL7 domains in 56 proteins in SMART's nrdb database. Taxonomic distribution of proteins containing IL7 domain. This tree includes only several representative species. The complete taxonomic breakdown of all proteins with IL7 domain is also avaliable. Click on the protein counts, or double click on taxonomic names to display all proteins containing IL7 domain in the selected taxonomic class. 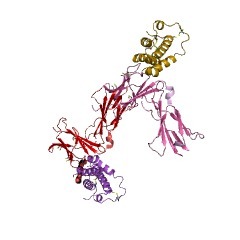 Interleukin-9: structural characteristics and biologic properties. Interleukin-7: biology and potential clinical applications. This information is based on mapping of SMART genomic protein database to KEGG orthologous groups. Percentage points are related to the number of proteins with IL7 domain which could be assigned to a KEGG orthologous group, and not all proteins containing IL7 domain. Please note that proteins can be included in multiple pathways, ie. the numbers above will not always add up to 100%.